Skiing violinist Vanessa Mae banned for fixed Olympic qualifiers. 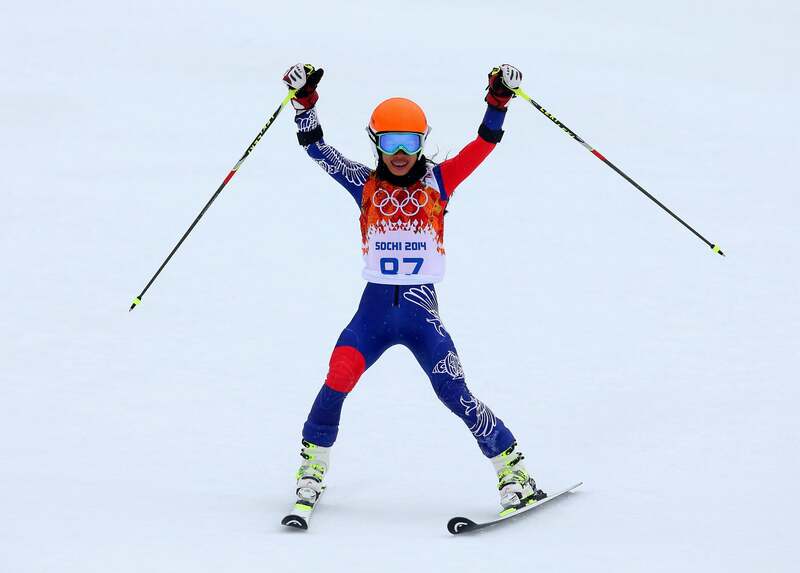 Vanessa Mae after a run during the Alpine Skiing Women’s Giant Slalom in Sochi. It was a good story while it lasted. Pop violinist Vanessa-Mae, at the age of 35, set her sights on fulfilling her dream of competing at the Winter Olympics. The British violinist, who has sold more than 10 million albums worldwide, just needed to qualify. With the odds too long to make the British team, she managed to qualify and compete in the Sochi games under the name Vanessa Vanankorn representing Thailand, her father’s homeland. Sure, she came in last out of 67 competitors in the giant slalom event. Sure, her time was 50 seconds behind the gold medal winner’s. But the Olympic spirit isn’t just about setting world records, right? [International Ski Federation] said the scam involved falsely inflating the quality of four qualifying races to artificially boost Vanessa-Mae’s standing as a potential Olympian. Race rigging included inventing times for skiers who did not race and faking times for lower-quality skiers who did finish. “A previously retired competitor with the best FIS points in the competition took part for the sole purpose of lowering the penalty to the benefit the participants in the races,” FIS said … “The competitions were organized at the request of the management of Vanessa Vanankorn, through the Thai Olympic Committee in its capacity as the FIS member National Ski Association,” skiing’s governing body said. Under current Olympic qualification rules, countries with no skier ranked in the world’s top 500 may send one man and one woman to the Games - to compete in slalom and giant slalom - if those athletes meet a second set of criteria. Thailand has no skiers ranked in the world’s top 500 for any Alpine discipline. To meet the second criteria, Mae had to produce an average of 140 points or fewer over five recognised races. Athletes earn points on an inverse scale based on their performance, so the fewer points an athlete has, the better they are.